“For many, it’s changing the entire trajectory of their lives,” says Malone. Eight years ago, local Chick-fil-A franchise Operator Keith Singletary was searching for more opportunities to get involved in the same community where Malone’s organization was already making an impact. “When I started at Chick-fil-A, I really found my passion, and that’s mentoring and impacting kids’ lives,” Singletary says. It wasn’t long before he found an opportunity, when Malone visited one of his restaurants and told him about Mentoring to Manhood. 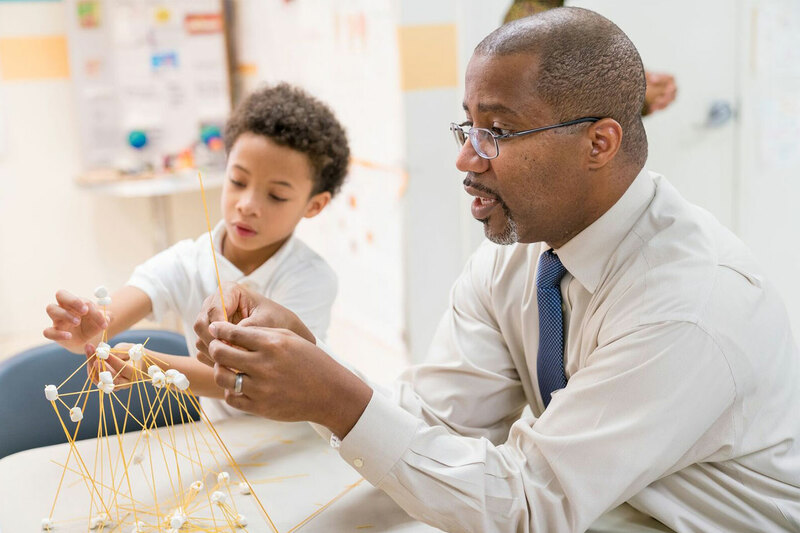 The connection was immediate and soon Singletary was fully immersed, with his own mentee and a calendar full of speaking engagements to inspire students at local elementary and middle schools. 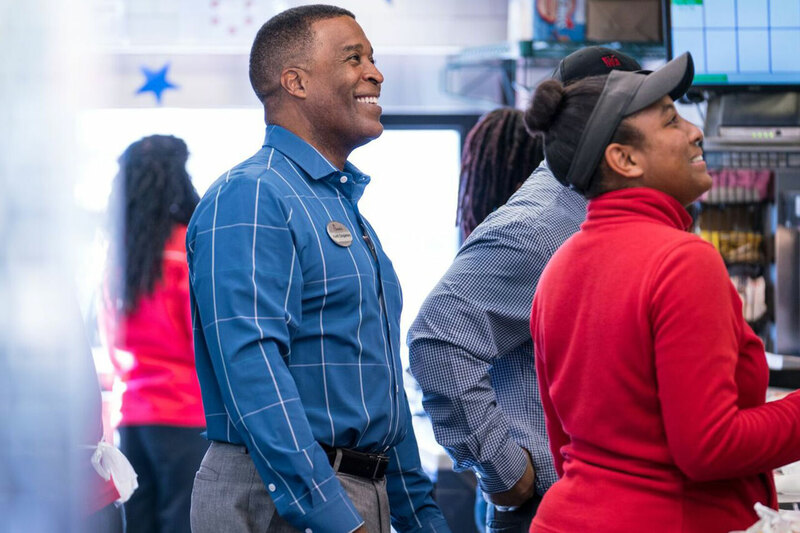 When local Chick-fil-A franchise Operators were invited to submit organizations for the 2019 True Inspiration Awards, Singletary was eager to send in his nomination. 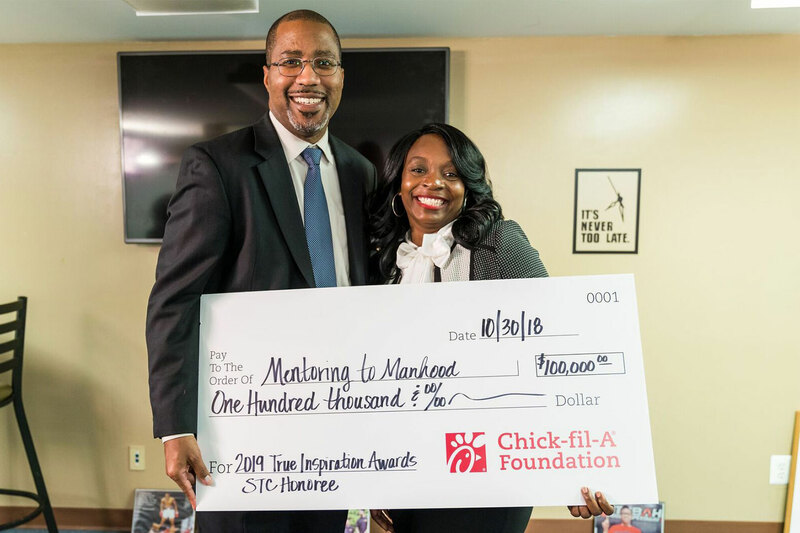 He knew Mentoring to Manhood was doing something extraordinary, and he wanted the Chick-fil-A Foundation to know it, too. This year, the Chick-fil-A Foundation proudly selected Mentoring to Manhood as the 2019 True Inspiration Awards S. Truett Cathy Honoree – an award reserved for the organization that embodies the innovative and entrepreneurial spirit of Chick-fil-A’s founder. 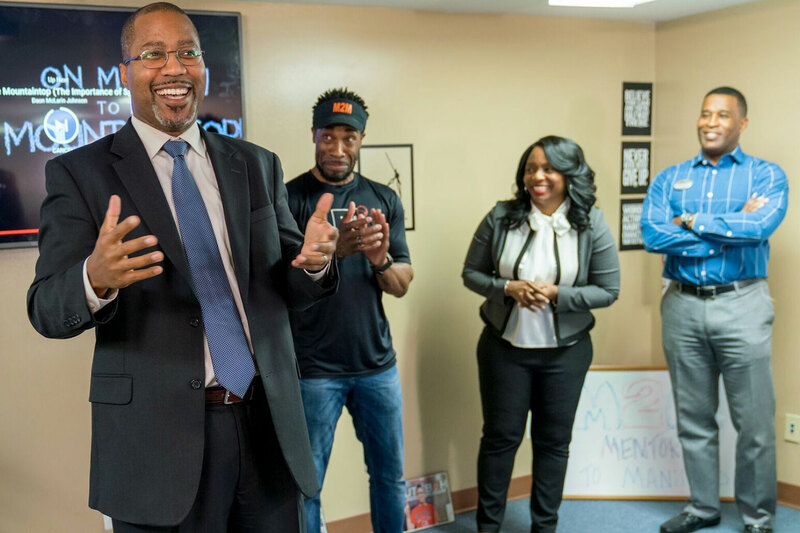 As part of this recognition, the Chick-fil-A Foundation – in partnership with Singletary – surprised the leaders of Mentoring to Manhood with a $100,000 check to continue their work. "Receiving the True Inspiration Award has been a great inspiration to me,” says Cindy Martin, co-founder and director of academic programs for Community Youth Advance. “Educating and mentoring youth is hard, emotional and life-changing. But every day it makes all the difference for the youth we serve," Martin said. The grant will allow Mentoring to Manhood and Community Youth Advance to provide access to both mentoring and specialized academic support. “We’re on cloud nine,” said Malone. The True Inspiration Awards began in 2015 to honor and support inspiring organizations that are making a real difference in the lives of children and young people in communities across the nation. This year, the Chick-fil-A Foundation will award grants totaling a combined $1.23 million to 22 organizations nationwide (see the full list below). “The True Inspiration Awards seeks to give organizations like Mentoring to Manhood the recognition they deserve,” says Rodney Bullard, vice president of Corporate Social Responsibility for Chick-fil-A, Inc. and executive director of the Chick-fil-A Foundation. Check out the full list of True Inspiration Award winners below and visit the True Inspiration Awards page to learn more about each of these incredible organizations.